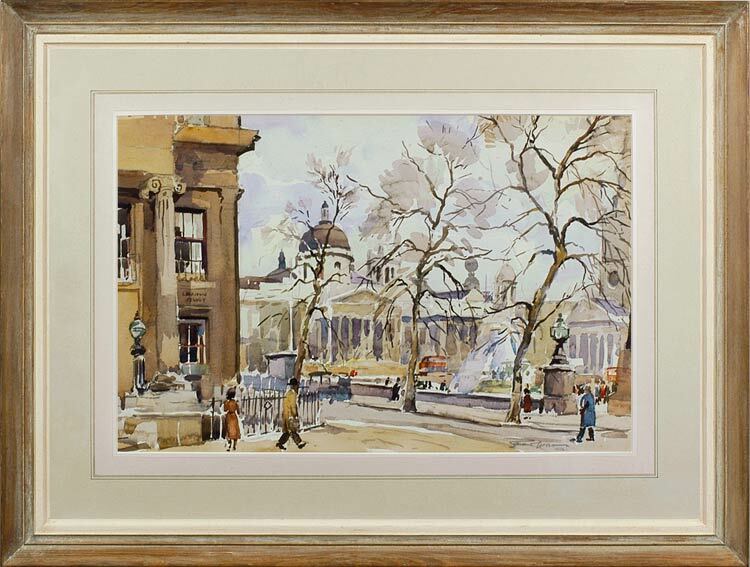 This busy urban scene demonstrates that Wesson is as skilful at composing and depicting the great public buildings, monuments, buses and pedestrians of London’s principal square as he is at evoking the empty skies and broads of East Anglia. Like a classical landscape by Poussin or Claude, this watercolour is given the traditional repoussoir of a dark, upright form at the left-hand side (here the corner of Canada House, rather than a conventional tree), which helps to define the spatial depth of the square and to set the buildings back, beyond the fore- and middle grounds. The cursive, descriptive brushwork gives the whole work a great spontaneity, and suggests the movement of the city beneath the moving clouds. Edward Wesson was born in Blackheath, London, spending his life in Kent, and in Guildford in Surrey. He was self-taught, and generally disparaging of art schools; however, he himself taught – both formal courses and through evening demonstrations to art societies (he was chairman of Guildford Art Society for many years). He served in the Second World War, in Sicily and mainland Italy, managing to develop his technique even under campaign conditions. He was elected a member of the Royal Institute of Painters in Watercolour (RI), the Royal Society of British Artists (RBA), and the Royal Society of Marine Artists (RSMA), besides exhibiting at the Royal Academy and the Royal Institute of Oil Painters. His true love was watercolour, for which he displayed an extraordinary facility, his bravura technique forming the centrepiece of his demonstrations. He was influenced, amongst others, by Eugène Boudin. See The Art of Edward Wesson, Ron Ranson, London, new ed., 2004; with thanks also to Iris Hawkins, who knew Wesson.